A new white paper by Ampersand Portfolio Solutions, The Risk Contribution of Stocks, Part 3, provides a path for mitigating the significant risk of over allocating to stocks as identified in its prior white paper, The Risk Contribution of Stocks, Parts 1 &2. In the new and final installment of the 3-part series, Ampersand introduces a way to diversify beyond stocks and bonds without having to sell the stock/bond portfolio holdings. Ampersand Portfolio Solutions, a division of Equinox, collaborates with select asset managers to construct bespoke investment solutions. Ampersand’s white paper, The Risk Contribution of Stocks, clearly illustrates the riskiness of a 60/40 stock/bond portfolio, showing that 92% of the risk is contributed by stocks. Diversifying the portfolio by adding another asset class such as managed futures yields improvements. Among the scenarios presented in the first paper, a portfolio with 20/50/30 allocations to stocks/bonds/managed futures provided the highest Sharpe Ratio among portfolios whose allocations to the three asset classes were constrained to add up to 100%. However, in the real world, it’s extremely rare to find portfolios with a 30% allocation to managed futures. How can investors gain the benefits of diversification without having to sell their stocks or bonds in order to allocate to another asset class like managed futures? 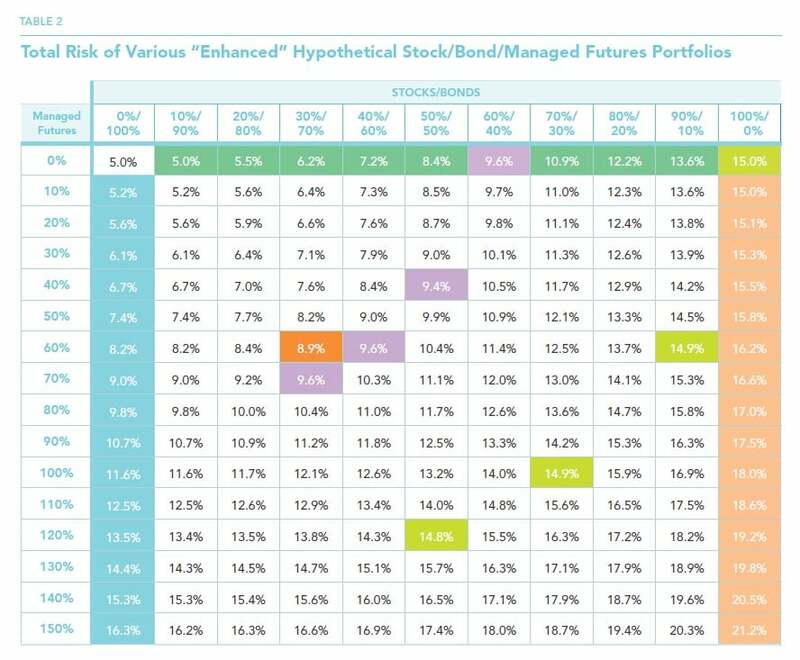 Ampersand’s hypothetical scenarios showed that a 20/50/30 stock/bond/managed futures portfolio provides the highest reward-to-risk ratio and could be considered the optimal allocation strategy. The fact remains that it’s extremely rare to find portfolios with allocations to alternatives as high as 30%. In fact, in most portfolios stocks continue to be the main source of risk, often exceeding 90%. The main reasons for under-diversification are the historical lack of available diversifying strategies and, when available, the opportunity cost of utilizing them. With few exceptions, investors who do have access to diversifying strategies tend to allocate only small amounts to alternatives, so stocks remain their largest source of risk. In addition, the traditional way to diversify is to sell stocks or bonds in order allocate to a diversifier such as managed futures. The portion allocated to the diversifier (managed futures) forces an investor to choose between stocks and bonds OR managed futures. In the end, however, this OR decision may result in giving up the returns that the relinquished stocks and bonds might have continued to earn. Ampersand proposes a new theory: there is no need to sell stocks and bonds to diversify into managed futures. How is this possible? These programs can be accessed by using 10% – 25% margin or collateral, and the stocks/bonds in an investor’s 60/40 portfolio can themselves be posted as collateral. This is an “overlay” approach, where the alternatives are overlaid on top of the stock/bond portfolio without the need to sell any stocks or bonds. Ampersand provides compelling charts that detail the expected returns of various “enhanced” stock/bond/managed futures overlay portfolios as well as the expected risk and Sharpe Ratio. The potential benefits of this “enhanced” diversification include: eliminating the opportunity costs of meaningful diversification; better balanced portfolio construction; and higher potential returns for investors with higher risk tolerance. In the previous two Insights in this series, we focused on the risk of various stock-bond-managed futures portfolios, and examined how much of this risk comes from each of their three component asset classes.1 Based on what we believe are some reasonable assumptions about volatilities and correlations, we first showed that most of the risk of traditional stock-bond portfolios comes from stocks. For example, 92% of the risk of a 60/40 stock/bond portfolio is contributed by stocks. Diversifying the portfolio by adding managed futures yields some interesting results. As we distribute the risk of the portfolio approximately equally across the three asset classes, it turns out that the risk-adjusted expected return of the portfolio potentially improves. Among the specific hypothetical scenarios we presented, a portfolio with 20/50/30 allocations to stocks/bonds/managed futures turned out to have the highest Sharpe Ratio among portfolios whose allocations to the three asset classes were constrained to add up to 100%. In this final Insight, we explore the possibility and the consequences of relaxing this constraint. Why Should We Consider Relaxing the 100% Constraint? Can This Be Achieved in Practice? We have shown, albeit under fairly simplistic assumptions, that a 20/50/30 portfolio may have a higher Sharpe Ratio than most others. However, the fact remains that, in the real world, it is extremely rare to find portfolios with allocations as high as 30% to alternative strategies. In our view, most portfolios continue to be significantly under-diversified, and, in most cases, stocks continue to be the biggest source of risk, their contribution often exceeding 90%. We believe the main reasons for this under-diversification are (i) the historical lack of availability of diversifying strategies, and (ii) when available, the opportunity costs, both real and perceived, of utilizing them. Until quite recently, many diversifying alternative strategies were unavailable to investors other than institutions or ultra-high-net-worth individuals. Investors perceived these types of investments— which often involve short-selling, use leverage and/or derivatives, and trade illiquid assets—as being either “too risky” or “too complex,” unlike investments in stocks and bonds. Managers of these alternative strategies expected to be paid for their skill in providing uncorrelated, absolute returns streams, and often demanded fees such as “2 and 20,” and performance-based incentive fees were viewed as relatively difficult to accommodate in a mutual fund structure. As a result, these alternative strategies generally remained out of reach for most individual investors, making it difficult for them to diversify meaningfully. For about a decade now, however, many diversifying alternative strategies have been packaged into mutual fund structures, making them more widely available. With few exceptions, even those investors who have access to “hedge fund strategies” tend to allocate only small amounts to alternatives, so that the equity market remains the largest source of risk in their portfolios. Further, the correlations to equities of many of these strategies increased dramatically during market meltdowns (such as the Global Financial Crisis of 2008). Thus, investments intended to be diversifiers of equity risk ended up displaying equity-like performance at precisely the wrong times. As we have discussed elsewhere2, managed futures was one of the very few strategies that held up well during the Crisis; even so, however, the typical allocation to them—generally below 5%—has almost invariably been too small to make a meaningful difference. Let us explore this concept of opportunity costs more fully. Consider an investor holding a $1 million dollar 60/40 stock/bond portfolio who decides to allocate 20% to managed futures strategies. Traditionally, the way to achieve this is to sell stocks and/or bonds and invest in a mutual fund (or other structure) that accesses the managed futures trading strategies. The managed futures mutual fund, however, typically takes in the $200,000 and holds most of it in the form of cash and equivalents, such as short-maturity Treasury bills. A small part of the $200,000 (usually 10% to 25%) is used as margin or collateral to access the managed futures trading program(s). Thus, a 60/40 portfolio effectively becomes a 48/32/20 stock/bond/cash portfolio, plus access to a diversifying return stream. If we believe that stocks and bonds in the long run have higher expected returns than cash (which they ought to, because they are riskier), then diversification has been achieved at a significant opportunity cost: exposure to stocks and bonds has been reduced by 20%. The decision has been framed—and implemented—as an “OR” decision: either you can be 20% exposed to stocks and bonds, OR you can be exposed 20% to cash and have 20% “notional exposure” to managed futures trading program(s). This is the opportunity cost, and it increases with the size of the allocation to managed futures. But does this really need to be an “OR” decision? We believe it does not; it can instead be structured as an “AND” proposition: full exposure to stocks and bonds AND the desired, meaningful exposure to managed futures. on top of the stock/bond portfolio without the need to sell any stocks or bonds. We will not go into details here about how exactly this would be implemented, as that would vary from case to case, but we will simply assure the reader that it can indeed be accomplished in practice.